Religious colleges are attempting to “re-write” the narrative that exists today about faith in education before societal hostility mobilizes to one day push faith-based institutions out of the “mainstream” of higher education. 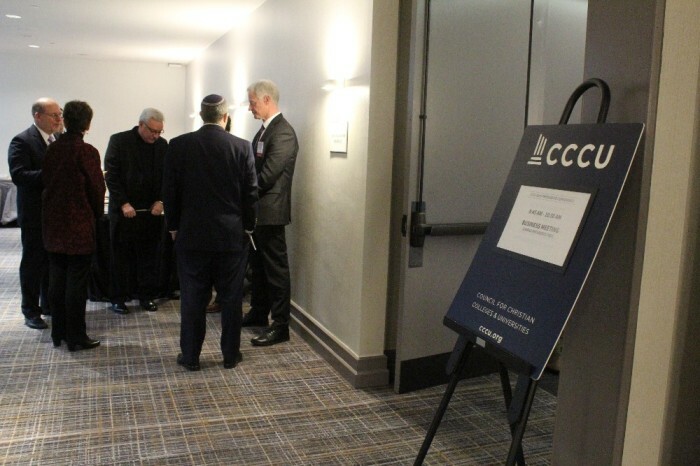 The discussion capped off the Council for Christian Colleges and Universities’ Presidents Conference that took place at the Washington Court Hotel on Capitol Hill. CCCU is a network of over 180 Christian colleges worldwide. "Today’s discussion invites us to reimagine this narrative that [characterizes] so much of the modern period and to rewrite this story going forward, to rewrite this story that persists so much in the world of higher education," Shirley Mullen, the president of Houghton College, a Christian liberal arts school in Western New York, said during the panel. “This standard western narrative of progress has assumed that deeply-held religious beliefs, especially when there is diversity in those beliefs, result in intolerance, conflict, violence, oppression." 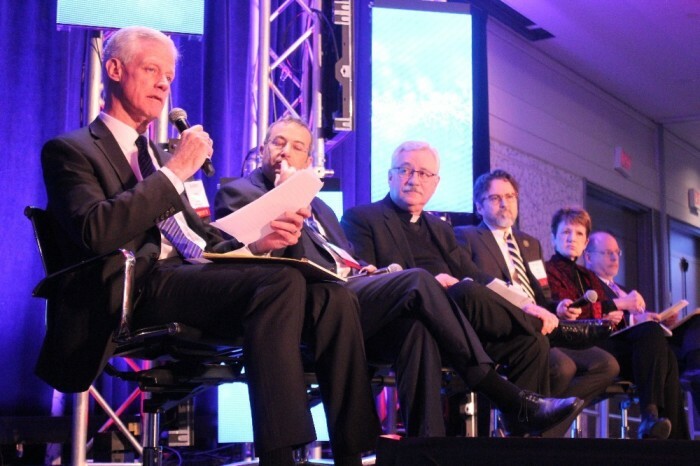 Mullen, who serves as vice chair of CCCU’s board of directors, contended that a “new narrative” must be crafted regarding the relationship between religion, society, higher education and human flourishing. “One of the great misperceptions out there today, particularly within higher education, is that our institutions would be the ones that are very monolithic internally and that students come here to learn how to think like Muslims or think like Roman Catholics or whatever,” Mullen said. As a historian, Mullen stressed that people don’t realize that “science actually grew up in the context of a religious framework that assumed a universal order that the world was a creation of a rational being.” She added that faith has also been the motivation for various social reform movements and the expansion of human rights in the modern period. During a press lunch following the panel, the presidents expressed their concerns with proposed changes to standards for accreditation issued by one of the nation’s regional college accrediting agencies, Higher Learning Commission, which oversees 1,300 post-secondary schools in the central U.S.
Last year, the HLC issued a draft rule proposal that removed language that instructed accreditors to take into account an institution’s “specific and diverse” mission when assessing a school’s commitment to diversity. The rule drew concerns from leaders within Christian higher education who fear that policies reflecting traditional Christian belief in marriage and sexuality could be questioned. As a number of Christian schools have statements of faith that oppose homosexuality, the fear is that the accrediting agency wields power to impact an institution’s abilities to receive federal student loans and federal grants if they are noncompliant. “It is noteworthy that this is really a plea for diversity from a group of universities that are sometimes viewed as not very tolerant in their viewpoint,” Kevin Worthen, president of Brigham Young University in Utah, explained. “There is one way in which you say everyone will be diverse in exactly the same way,” Worthen replied. Yusuf weighed in and said that if religious colleges are supposed to take their religious traditions seriously, then the demand that they “abandon a set of core principles of the religions for the zeitgeist” is not fair. One reporter brought up the public outrage surrounding Karen Pence’s decision to teach at a Christian school in Northern Virginia that has clearly outlined beliefs opposing homosexuality. While religious colleges are guaranteed the freedom to hold religious beliefs by the U.S. Constitution, one reporter asserted that the Constitution doesn’t guarantee religious colleges federal funding. Mullen responded by stating that it has always been understood that federal dollars are tied to individual students who have the freedom to choose where they spend those federal dollars. Mullen believes that civil society would be “worse off” if religious colleges were not granted access to federal funding. “That is really what we are arguing for right now is the right to remain within the mainstream of higher education rather than be segregated off,” she concluded.